Heath Black is a retired AFL footballer who struggled with mental illness throughout his 12-year professional career. 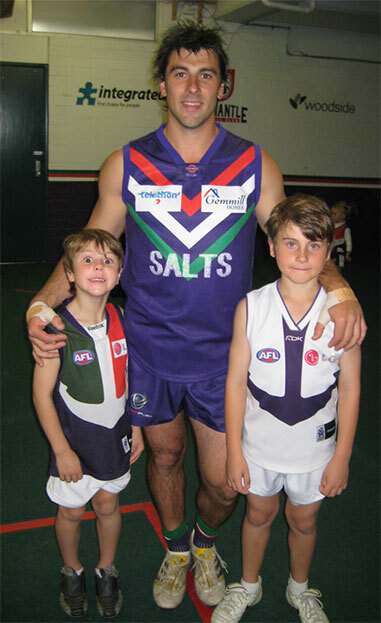 Originally from Victoria, he started as a 17-year old in 1997 with the Fremantle Dockers, moving to St Kilda for a stint and finishing his career at the Dockers in late 2008. Heath was well known in football circles and perceived by the public as a bit of a bruiser and larrikin. Towards the end of his football career he had a series of public misdemeanours which marred the solid reputation he had built over his career. Spiralling out of control, Heath realised the full extent of his mental issues in 2009 following the failure of his marriage, lost job opportunities, several arrests and a growing dependence on alcohol. He was finally diagnosed with Bipolar II and ADHD type 6. Heath has spent the last 18 months getting his life back on track, but rather than sit back he has decided to use his profile and experience to try and help other men who may suffer from Bipolar, ADHD or other related mental conditions such as depression, anxiety, isolation and alcoholism. These conditions are more common than most people would expect and often kept behind closed doors; which is one of the reasons Heath has decided to tell his story. Spiralling out of control, Heath realised the full extent of his mental issues in 2009 following the failure of his marriage, lost job opportunities, several arrests and a growing dependence on alcohol. He was finally diagnosed with Bipolar II and ADHD type 6.